1. What is a unit study? When you pull together all kinds of fun activities for one topic of study, you have a unit study. Homeschoolers will do unit studies about a certain time period in history or a science topic their children want to explore. When all subjects (besides math) are tied together, retention is higher. For a Renaissance unit study, you could enjoy watching Shakespeare in the park, write poetry, read about Leonardo da Vinci, and create your own invention. 2. How do you put together a unit study? First you would collect books from the library about this topic. I always look for supporting DVD’s, which you have to be careful to preview before showing your kids. You can decorate a notebook about that topic, and have your children do fun writing assignments about what they are learning. Create field trips and hands-on learning experiences to go along with your study, and you will have mastered that topic. 3. How can you get ahead on academics through unit studies? How does that work? You can definitely get ahead academically through unit studies in the content areas. Those would be history and science. We covered all the time periods in history several times, and we covered each topic in science in-depth. We ran out of science topics, and my kids were ready for high school science at age 10 because we had gone so in-depth on each of the topics. My son Stephen began high school Biology at age 10 and aced all his Biology exams. He now wants to be a microbiologist. 4. Do you have to do crafts if you use unit studies? No, you do not need to do crafts if you do unit studies. But part of what unit studies stands for is hands-on learning. So you can cook a meal from the time period you are studying (that’s not a craft), or go on a field trip that correlated with that topic (which is also not a craft). Many families who do unit studies don’t do any crafts but instead create a notebook where they can bring to life that topic through drawings, creative writing, or 3-dimensional pages that have fold-outs or envelopes that you put something into. 5. How do you not burn out while doing unit studies? That’s a great question and one that I’m asked a lot. I do unit studies in spurts. We might only read living books for 3 weeks, and then on the fourth week we do a ton of hands-on activities all back-to-back. If you’ve just had a new baby, you can read to the kids for a while. One year when I was exhausted from a new baby (or some other trauma in my life), I read great classic works of literature for the Middle Ages, and it wasn’t until I regained my strength by the end of the year that we did tons of hands-on activities like a Medieval feast and a huge cardboard castle. 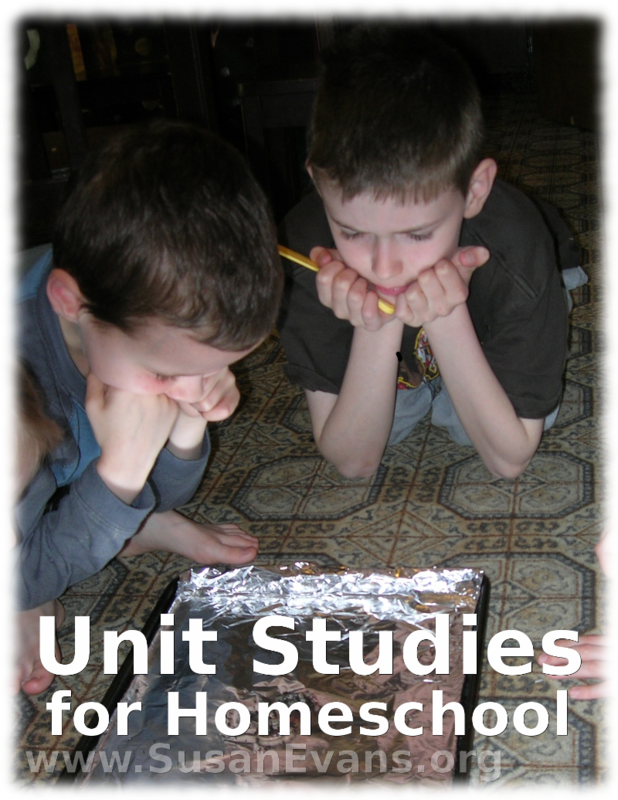 So you can homeschool with unit studies, and it doesn’t have to be labor intensive. 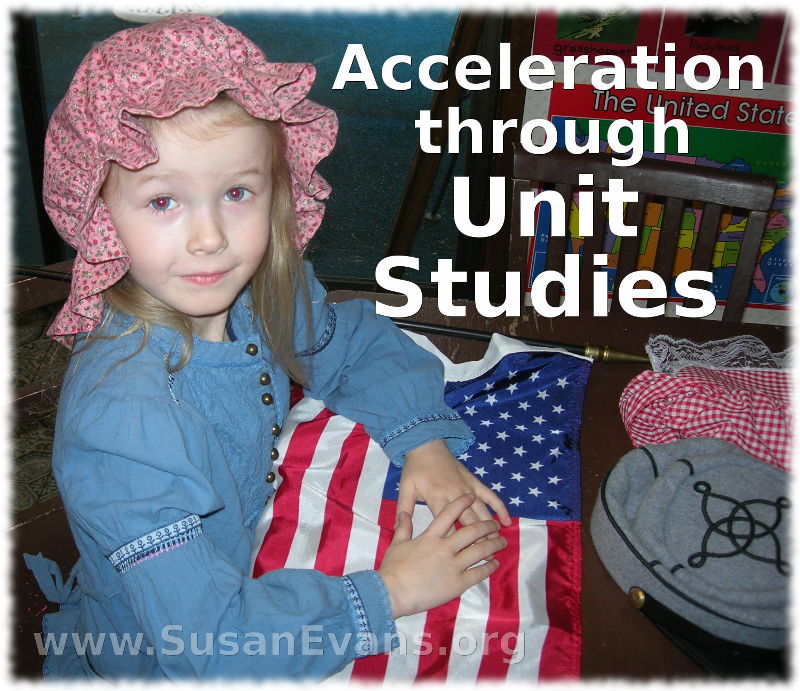 Because unit studies simplify your homeschooling while going deeper into each topic, acceleration through unit studies is possible. For example, I completed a one-year elementary astronomy course with my children in one month. It was relaxing and fun to only do one topic in our homeschool after doing math first thing in the morning. The rest of the school day was spent splashing into the topic of astronomy. At elementary ages, I would do either science or history for our unit studies. I alternated between science and history. Literature was usually tied into either science or history. If it wasn’t, I would read the novel in the summer or over Christmas break. For example, I read A Christmas Carol one week during the month of December while the children were drinking hot cocoa by the fire. While studying botany one year, we read The Secret Garden alongside our science study. Because we have all the time in the world and haven’t chopped up our morning into dinging bells every hour that abruptly force us to change topics, we are better able to have a coherent study. Right now I’m reading Uncle Tom’s Cabin to my kids, so in the evenings, we were watching some Civil War DVD’s from the library. We are plunging ourselves into the time period while munching on popcorn. Our whole day makes sense and isn’t schizophrenic. Delight goes a long way in how much information we retain from our studies. I have been astounded at the huge majority of facts my kids remember because the grid in their minds is robust in each topic. When you are studying a topic for only one chapter in a boring textbook, it’s hard for your brain to latch onto the information and remember it. If you spend huge amounts of time in each topic, you remember just about everything because you “lived it.” Living something is different than forcing yourself to learn dry facts. Unit studies give you hands-on and living activities that enable you to grasp that topic on a deep level. So yes, our kids have done acceleration through unit studies. They were ready for high school science before the age of 10. We had gone through all the sciences in depth, sometimes more than once, and I kicked back for a couple of years and didn’t do science because we were so far ahead, and high school chemistry requires Algebra. Instead those years were spent building robots for robotic competitions for their Robotics Club, and they tinkered with electronics with their father. Meanwhile we did tons of history, Shakespeare, and other topics because we had all that extra time left over. 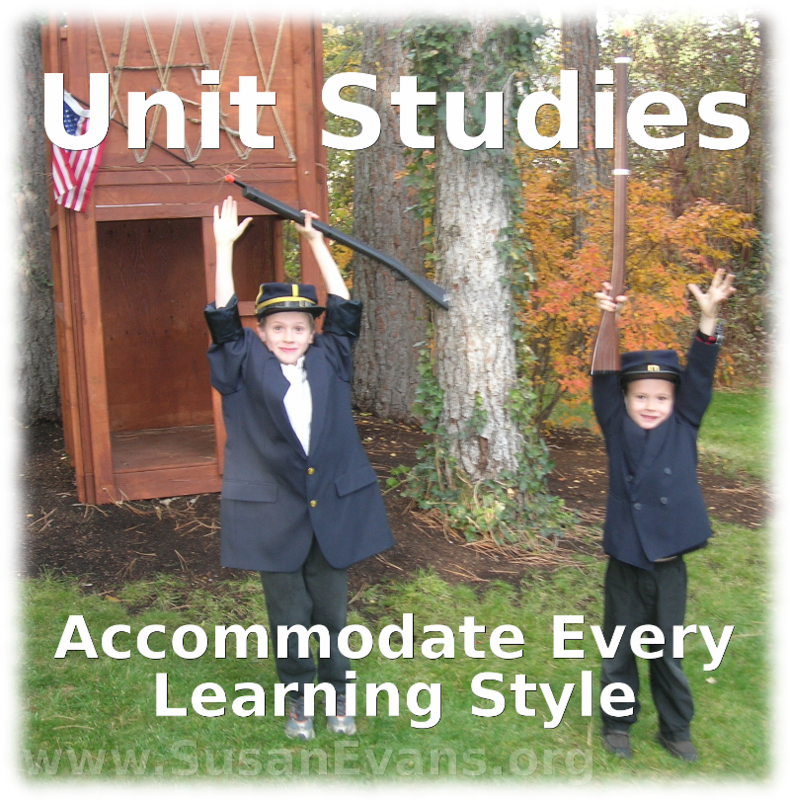 If you are looking to simplify your work in putting together unit studies and would like to have more fun in your homeschool, save yourself a lot of time and effort by joining the Unit Study Treasure Vault. 1. With unit studies, an expert who loves the topic is writing about it. If you check books out of the library about a topic, those books are written by an expert who loves that topic. Not so with textbooks. With a textbook, an author writes about lots of topics in a superficial way, and you don’t feel their passion dripping off the page like you do with real books. When a person has spent years thinking about a topic and studying it, what they write will be completely different than a person who is churning out writing to fit into the grid of a textbook. When you interact with an author with a passion for birds, for example, you start understanding and loving birds more. Their passion spills off onto you, and learning is much easier. 2. 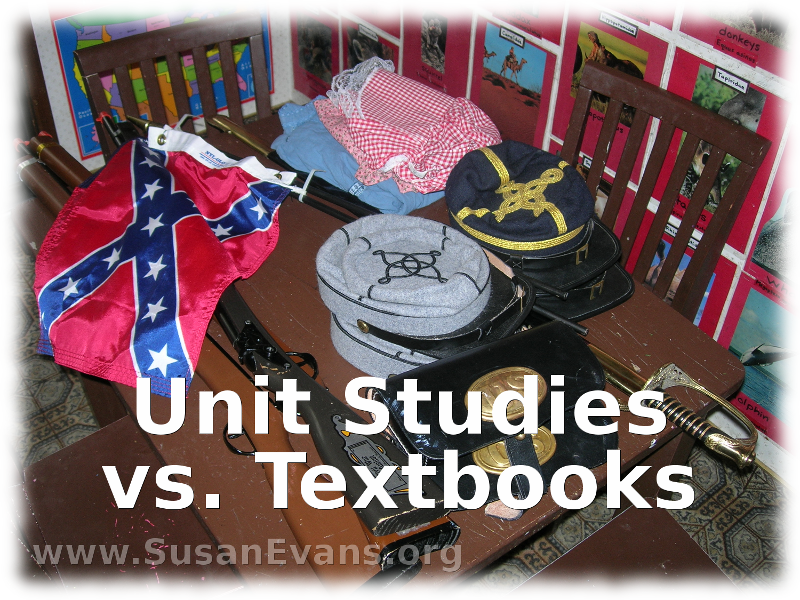 With unit studies, you go more deeply into each topic instead of skimming the surface. In a world of mass schooling where you don’t know what kids have learned in history and science from year to year, you have to hit all the topics, just in case they missed something the previous year. Mass schooling is like that. The teacher does not know what the student has previously taken in the content areas of elementary grades, because textbooks vary from school to school and state to state. There is one chapter on astronomy, for example, year after year. How much astronomy can you cover in one chapter? Wouldn’t it be better to do a whole year of astronomy, going in depth and actually learning the fascinating intricacies of our universe, and then you don’t need to cover it again, because it’s a part of who your children are? Do the same thing with each topic in science, taking a month, several months, or a year to splash into the topic until you have mastered it to some degree. Superficial learning is for people unfortunate enough to be in a mass schooling situation, not where we know exactly what our kids have learned because we taught it to them ourselves. 3. Textbooks are a failing system. Don’t imitate a failing system. The school system is churning out half-illiterate kids. The textbook system that is being used is a failing system. There is no reason to be enslaved to a system that is a failure. Textbooks are notorious for being dry, and kids have to cram for a test and promptly forget the material. Not so with unit studies, which always have a “bring-it-to-life” component where you experience the topic. After interacting with the topic in tangible ways, the students find it easier to remember the subject they are studying. 4. You can accelerate your education through unit studies. I will write a whole article about this tomorrow, but suffice it to say that you will finish all your sciences in-depth while relaxing at your own pace. You don’t have to spend bazillions of hours going through every tedious page of those heavy textbooks that cut off the circulation in your legs as you read them. You can do LESS and get AHEAD and retain more knowledge, having fun doing so. Imagine doing less work and having more energy to enjoy your learning so that it’s not at a frantic pace. 5. Textbooks chop everything into separate subjects that don’t inter-relate. When you splinter your learning, chopping it up into bits during the day, it’s almost like a schizophrenic merry-go-round, where you are just checking off everything as it goes by in a blur. Why not step off the merry-go-round, delving into only one topic, and having all the learning revolve around that? After doing math in the morning, we spend a wonderful oasis of time splashing into ancient Greece, reading Greek mythology, re-enacting famous works with minimal props, writing fun skits to show the grandparents, and painting Greek pottery patterns on clay. The kids love it! They are living it, which is why they remember it. It’s alive, and you can allow your mind to dwell there for several hours a day instead of forcing your mind to focus on disconnected pieces. 6. With unit studies, you have less to do, and you’re smarter at the end. 7. With textbooks, each of your kids has a tall stack of books to do by themselves in the solitary confinement of their bedrooms. With textbooks, the kids feel chained to their room, unable to get out until they have jumped through all the meaningless hoops dictated by committees that randomly decided what THEY wanted your child to learn. Don’t you want control over what your children learn? Don’t you want to decide? We as parents are not too stupid to make these decisions. As long as we cover all periods of history and all science topics at least once, it doesn’t matter how we do it. By the way, the schools don’t really teach much history any more, and almost no geography. Take matters into your own hands. Forge your own path. 8. Family unity is established through unit studies and not through textbooks. Create memories with your family. When all the brothers and sisters are learning about the same topic on their own level, they have shared memories and can help each other learn the material. With field trips and hands-on learning, there will be more laughter and a feeling of togetherness. Older children can help younger children, and everyone benefits. The shared memories create a sense of family identity. Come back tomorrow to see how you can accelerate your children’s education through unit studies.